As you know I'm running for parliament in the 2010 UK general elections for Dulwich & West Norwood. The race is very tight. Last year, a survey was carried out in this constituency by the News Of The World and the forecast was that I would win. This year, things are a lot tougher as the party has dropped nationally in the polls. I need your help! There are just about 20 days to go before polling day and Nigerians have been fantastic. My immediate circle of friends, ex-school mates, their friends and all our families have really rallied round and have been supportive. UNFORTUNATELY, those that don't know me have been very unpleasant. In a recent BBC interview, a caller insulted me because I'm Yoruba. I was very disappointed that a Nigerian woman who claims to have lived in London for 45 years has issues with me being Yoruba than with my political views and shamefully made her comments on national radio. We really need to get out of this mindset where we are fighting one another and try and support each other instead. Regardless of party allegiance, a Nigerian in parliament winning purely on merit and not because of her relatives or by buying the election will be amazing. Like you, I am sick and tired of reading that Nigerians are fraudsters, terrorists, bombing airplanes or slaughtering each other in places like Jos. Our generation has suffered enough from the mistakes of the past, and it is up to us not to repeat them. So I am asking for your help now to support a Nigerian who is trying to improve our national image and do something great here. 1) Use whatever influence I have to speak out against those who are cheating and robbing Nigeria and who seek refuge for themselves or their money in the UK. 3) Fully support and help to publicize genuine grassroots initiatives such as #lightupNigeria, where the next generation of Nigerians are trying to change things for the better. This is a chance to have someone who has real influence over what is going on with British-Nigerian relationships. It will not be about personal gain. For regular updates, please join my fan page here and my "Nigerians for Kemi" mailing list by clicking here or email me for more details and forward this to as many Nigerians as you know. Going down in smoke with David Cameron. You could have focused on issues that the conservatives and many of your potential voters have in common. If i were your constituent, I'd be very upset indeed by this post. If I were your opponent, I'd use this against you. B) You are completely clueless. Are you going to the British Parliament as a Nigerian to serve Nigeria? If so you have no business going there, and I would not vote for you for exactly that reason. Dulwich is not Nigeria, if you want to serve Nigeria then go to Nigeria and run for office. This is a pathetic post, it's insulting to Nigeria and does you no credit. I have always held you in high regard, but you've gone and undone that, reminds me of that saying - "Better to be quiet and remain the fool, than open your mouth and erase all doubt". 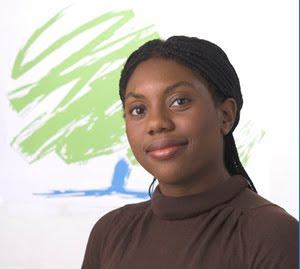 Kemi Adegoke is gunning for the British Parliament as a 'British' person. If she were not British, she'd never have been given this chance. The Tories are using her to downplay their xenophobic policies, and she wants to use Nigerians. But Nigerians are not so stupid. I agree: if she wants to work for the interests of Nigerians, she should go to Nigeria and run for office there. I wonder which white Dulwich idiot will vote for her after this call. For an aspiring politician, she seems to be a bit naive, almost stupid, to think this will wash. Spoken like a true politician - lies, naivety, and the audacity to assume her audience is stupid. Oh dear, these comments have been unduly harsh. I do not think there is anything wrong with the statements expressed by Kemi on this blog, I'm sure thats not all she beleives, this is called the naija blog yo, she's not exactly going to use this as a forum to discuss what she thinks about taxes. That being said provided they still perpetuate their beleifs and policies I will never ever vote conservative, Ever. Very impressed with your audience. They surely know bs when they read it and are freely expressing their views! Okay, o de ti to o! No more pilloring after this. We all make mistakes. I'm sure Kemi has learnt her lesson. We are not stupid and we do not like to be patronised. You being Nigerian is not enough to be elected into a British parliament. You have to be an intelligent Nigerian campaigning on BRITISH issues. Kemi, you really have bought into that stereotypical thinking that Black people are not intelligent enough to know what's good for them. We can tell our agbalumos from our oranges, thank you! this is a case of misplaced campaign strategy.the woman who called deliberately attempted to catch a sprinter's attention while on the race track approaching the finish line. Kemi Focus on the main issues and ignore small minded pple. i'm Nigerian and for 2 simple reasons I sincerely wish you wouldn't win this election. (2) You have not impressed me with your promises at all... you sound like a typical PDP candidate. Sorry, may be next time.